President Donald Trump meets with French President Emmanuel Macron inside the Elysee Palace in Paris Saturday Nov. 10, 2018. President Donald Trump escalated his verbal assaults against France on Tuesday, railing against America’s European ally for misreported comments by the country's president about the need for a European military and over tariffs France places on American wine. Trump also defended the fact that he skipped a trip Saturday to honor WWI war dead at the Aisne-Marne American Cemetery at Belleau Wood in Northern France after rainy weather grounded his helicopter. The president did go ahead with a trip and speech in the rain Sunday at the Suresnes American Cemetery and Memorial just outside Paris. "By the way, when the helicopter couldn't fly to the first cemetery in France because of almost zero visibility, I suggested driving. Secret Service said NO, too far from airport & big Paris shutdown. Speech next day at American Cemetery in pouring rain! Little reported-Fake News!" he tweeted, after correcting a misspelling for cemetery. That tweet attributing the cancellation to the Secret Service appeared to contradict what press secretary Sarah Huckabee Sanders had said on Sunday. A car ride would have required road closures on short notice and Trump "did not want to cause that kind of unexpected disruption to the city and its people," Sanders said then. On Tuesday, Trump tweeted about a suggestion by French President Emmanuel Macron that Europe build up its militaries because the continent can no longer depend on the U.S. for defense. Macron had also said Europe needs to protect itself against cyberthreats from China, Russia and the U.S.
Macron's comments were inaccurately reported and Trump continues to misrepresent them, seemingly for political hay. The French leader's office said Trump had lumped together Macron's remarks on protecting against cyber-threats and "interference in our democracies" from "China, Russia and even the United States" with Macron's later statement on military defense. The president has long complained that NATO countries don't pay their fair share of the defense alliance's expenses, leaving the U.S. to carry much of the burden. 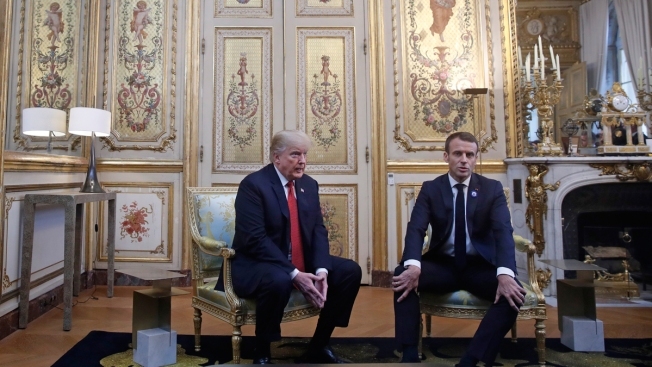 He criticized Macron before and after attending a weekend ceremony in Paris to commemorate 100 years since the end of World War I.
Trump and Macron discussed defense, trade and other issues when they met Saturday at the Elysee Palace. A top adviser to Macron said Tuesday that the French position has been "clarified." The official, who spoke on condition of anonymity in keeping with French customs, said Macron explained the European army issue to Trump, stressing that France was not making a choice between a European defense mechanism and multilateral organizations such as NATO. Gerard Araud, France's ambassador to the U.S., challenged Trump's assertions. "For the sake of truth, Pres. @EmmanuelMacron didn't say that EU needed an army "against the US". It was an erroneous press report," Araud tweeted. Trump also complained Tuesday about tariffs on U.S. wines sold in France, saying it's "not fair, must change!" He also appeared to take a dig at Macron's low public approval rating. Trump's standing with the French is lower than Macron's. Trump, who built a career in business before he entered politics, opened a winery in Charlottesville, Virginia, in 2011. Trump appeared to be referring to Macron's comment Sunday during a speech for the World War I centennial in which he decried the rise of nationalism across Europe and elsewhere, calling it a "betrayal of patriotism." The comments were widely viewed as a rebuke of Trump, who sat stone-faced with other world leaders as Macron spoke and who embraces the "nationalist" label despite the negative connotations associated with the term. Trump's continued complaints about France and Macron struck a nerve with some in the European nation, especially since the latest broadsides came on the third anniversary of the Paris terror attacks that killed 130 people in 2015. It prompted French journalist Hugo Clement to tweet in response: "We are already great, especially on november 13th. Go back to your room and give the phone to an adult." The complaints were also another marker of the up-and-down relationship Trump has had with Macron since they first met last year.